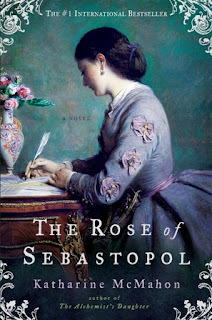 Thanks to the gracious folks over at Penguin Publishing I have 2 copies of The Rose of Sebastopol by Katharine MacMahon to giveaway! The paperback version is being released today. Giveaway is open to US entries ONLY and ends on February 16th. Just leave a comment to enter! ABOUT THE AUTHOR: Katharine McMahon is the author of The Alchemist’s Daughter. A former English teacher, writing instructor, and actress, she lives in Hertfordshire, England. For more information on her novels and research, please visit: http://www.katherinemcmahon.com/. Thanks for another great giveaway Amy! the story sounds great, thanks for another giveaway Amy! I know where to come to find out about great historical fiction! This is another one for the TBR pile. Please enter me. Thanks! Oh this book looks lovely! I would love to be entered in the contest. Love all of your reviews ! Thanks for the great giveaway. I would love to read this one, sounds very interesting! Please sign me up for this one. This book sounds amazing, please enter me to win a copy. Thank you! Sounds great!! Please enter me for this one. This book takes place in an interesting point of European history. It sounds good. I can't wait to read it. I would la la LOVE to win! Yay! This sounds like such an intriguing novel, and the cover alone is enough to encourage me to want to read the book. Thanks for the giveaway. I follow your blog on Google Reader, and am always drawn to the books you review. Please throw my name into the hat! Thanks! I remember wanting this book when it first came out, so please enter me! Great giveaway. Enter me please. Please enter me for this historical fiction! I love reading books about the Victorian era. Count me in!! Thank you for entering my name! I've been eyeing this book for a while. Thanks for the giveaway! I've been wanting to read this book for quite a while. Thanks for the giveaway! I would love to win a copy, forgot to leave my email earlier. Another historical fiction book. Yay! :) Love these new titles. Kindly include me in the giveaway. Thank you! Another gorgous book. Please count me in. Looks interesting, count me in! I've been seeing this book around and think it looks wonderful! I would love a copy so thanks for hosting such a wonderful giveaway! This book sounds great. Count me in. I really enjoyed The Alchemist's Daughter. Please enter me in the drawing for this new one! This one looks great! Thanks for the chance to win. I have wanted to read this for so long, but I have to admit part of that is because I grew up in Sebastopol, CA so I love the title. This sounds really good! Thank you for the chance to win it! Thanks for another wonderful giveaway. This book sounds good too. Please enter me. Please enter me! I love these kinds of books.